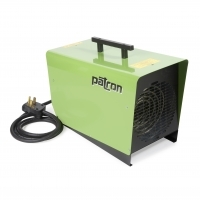 The Patron E9 is a top seller which exceeds expectations on a regular basis. It can be used in the most demanding of environments and has proven its abilities in hundreds of applications. The E9D is a 240V unit and pulls 25-37.5 amps. This means it will run flawlessly off a household dryer or stove receptacle. Make sure your receptacle is a NEMA 14-30P or 14-50P configuration, to ensure compatibility with our plug. The E9 produces a ton of heat, and disperses it in large areas with its 350 CFM fan. L x W x H 23" x 14" x 18"